Just the word ‘conflict’ brings up emotions that have us want to change the subject. It brings up memories of broken friendships, damaged careers, sleepless nights, heart palpitations and the list goes on. Conflict however is not going away as long as people think in different ways and have different ideas. It’s the way people deal with disparate views so that new ways of thinking arise, raising personal and societal awareness and advancing life. So why do so many people relate to conflict as a bad thing, personally threatening and something that they should avoid? In working with executives for over 20 years, we’ve found that conflict brings up certain feelings that are very personal and very uncomfortable – e.g. self-doubt, inadequacy, failing, isolated and alone, humiliated, disappointment, stupid, weak, pathetic, powerless and bad. It’s more about avoiding these feelings than it is about the event that involves conflict. Conflict is not inherently uncomfortable – we engage in conflict at dinner parties, discussing where to go for our next vacation, deciding on what school to send the kids to – it’s there with us every day and for the most part, we engage in it effectively. It’s how we try and avoid those uncomfortable feelings that creates the problem and has us less able to deal with conflict in our lives – avoid, withdraw, aggression, saying yes when we don’t want to, agreeing when we disagree etc. 1. Take a moment and connect with how conflict makes you feel – do you doubt yourself, do you feel like you are going to disappoint someone or the other person will no longer like you if you put forward a view different to theirs? Is the way you are about to respond going to make a difference? 2. Do you think that the other party is making you feel this way? Do you think they have an intention to make you feel this way? Remember, how you feel is based on your perception of what’s happening, so it’s your perception that brings up these feelings, not the other party. Keep in mind that they are dealing with their feelings about conflict at the same time you are dealing with yours! 3. 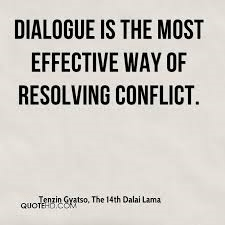 View conflict as an opportunity to deepen relationships, fix things that have not been working, generate new ideas and to grow. 4. Put your attention on the other person/s and ask questions to find out what’s important to them about the issue in conflict. Relate to their response as valid and important to them and see if you can help them. 5. Share what’s important for you about this issue and why it’s important to you. Give the other person every opportunity to help you as well.